Meet Jhenie, Teaching Kitchen graduate from class 27! Originally from Haiti, she worried her limited English would keep her from getting a great job doing what she loves. However, soon after completing our Teaching Kitchen 12-week course, Jhenie was hired as the kitchen assistant at Women’s Lunch Place. In her role, Jhenie helped prepare beautiful meals for 300+ women in need and helped ensure the kitchen ran smoothly. 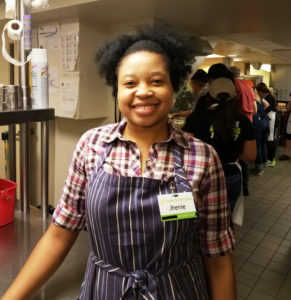 The Women’s Lunch Place staff and guests loved the joyful energy that Jhenie brought to her work every day. We’re so proud of you, Jhenie!